Shout out for Revi Mendelsohn! She also gave us her honest opinions and did not try to sway us into selling. Here’s a shout out for Revi Mendelsohn! Over the years, I’ve seen many posts both by Revi helping fellow Peachheaders, and also by Peachheaders singing Revi’s praises. I called Revi because my husband and I were contemplating whether to update and possibly add on to our existing house, or sell and spend a lot more money. Revi talked to me for a long time on the phone and came to our house to give us her opinion. She not only took a great deal of time to trek to the valley, but spent a lot of time walking through our house and sitting down and talking with us. She did all of this knowing there may not be any professional gain. She also gave us her honest opinions and did not try to sway us into selling, which would have been an easy option. I cannot say enough good things about the integrity and warmth I felt from her. Regardless of what we do right now, Revi will have our business whenever we decide to sell, and I plan to refer anyone looking for a great real estate agent her way! She provided me with support, options and resources….. I just want to take a moment to share something good that happened in the past couple of days. I’ve been navigating a long and sometimes painful (no, really) journey toward the ideal home for my family, and I reached out to Revi, having seen how well trusted she’s been amid the PH community, for some much-needed advice. Firstly, she got back with me immediately (always impressive), and then she listened and really heard my dilemma, after which she provided me with support, options and resources that are already proving so valuable to this process. Most impressive, she spoke with me for well over an hour, exhibiting rare grace, empathy, even sympathy, and understanding, without pressuring or pushing any agreement on me. As a result, of course, I’m inclined to work with her going forward. Always great to encounter someone who is knowledgeable, generous and also a fluid communicator. Sandra Boissier- Home Seller in 2016 for approximately $1.425M in South Carthay, Los Angeles, CA. "Revi helped me realize my financial goals. She mapped out a 4 year real estate plan that has put me in a better financial situation than I could have ever imagined. Revi always puts her clients' interests first, and has an unmatched instinct for how to conduct and succeed in transactions. I highly recommend calling Revi FIRST if you want the job done right and with great results. And we love her chocolate chip cookies!" Revi is literally my HERO! She helped me sell my townhome when others before her failed. Despite all the issues that unveiled themselves during the escrow process during the sale of my property Revi stuck by me and guided me through everything always reassuring me that everything will work out in the end and they did! I would highly recommend Revi to handle any purchase or sale of any property because she is not only smart and does her research, but really because she cares about her clients best interest and does everything and anything to help the process go smoothly and correctly. ……a good marketing job that we had 12 offers to pick from. "I have known Revi for years through Peachhead, and have pestered her with real estate questions for as long. So when we were moving out of the area and wanted to sell our townhouse, we naturally called her. She was a pleasure to work with and handled all sorts of odd things that popped up that would have flustered a less experienced agent. She sold our place quickly and for more money than we even hoped for. There were several occasions when the buyer tries to get more credits, sneak things into a contract or pay less money, but she anticipated these attempts and thwarted them so that we got the full amount. It helped that she did such a good marketing job that we had 12 offers to pick from. Throughout the whole process, she made herself available at all hours of the day and night to talk on the phone or text, and she made us feel like her only clients. I would not hesitate to recommend her." 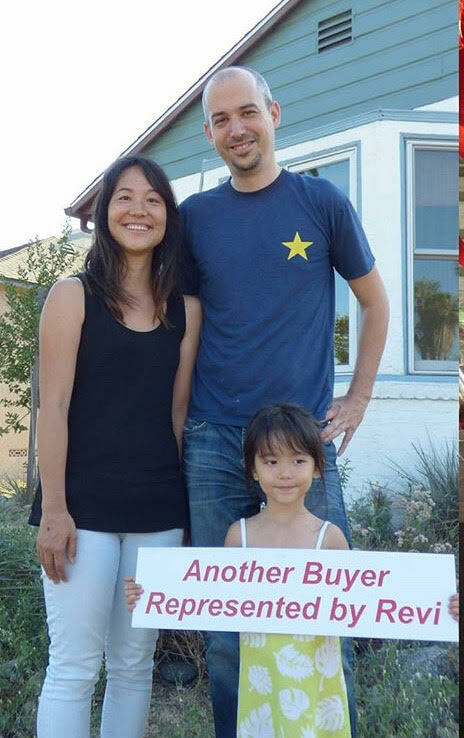 Revi helped us buy our first home in Del Rey, and we had a great experience working with her. Her negotiation skills are firm without going too far. She also could recommend to us a number of people who made the process move smoothly and work seamlessly with her - a mortgage broker, inspectors, contractor, etc. It went off without a hitch and since we bought in 2012, the home has increased in value quite a bit. Thank you Revi! I am so pleased I am working with her again…..
Revi was referred to me by a work colleague 7 years ago and helped me buy my first home. I was so pleased that I am now working with her again to buy my second home with my now wife. When the time comes she will of course be my go to to sell my condo. Revi is detail oriented and a truly experienced veteran in real estate who knows the ins and outs and will always "go to bat" for her clients. Thanks Revi!!! amazing negotiating and communication skills to every deal. It was a pleasure working with you on the Lyster transaction. You are a phenomenal realtor and it truly showed through your professionalism and character. Also, thank you for the very nice card that you sent me. That was very sweet. I wish you the best of luck in all future endeavors. Revi's ability to navigate through difficult situations is amazing. Her knowledge of the real estate transaction process is superb. I trusted Revi to handle all of the curveballs that were thrown at us and helped us successfully sell and purchase our home. Her negotiating skills are awesome, as well as her customer service, her knowledge of the real estate market, and posseses a never ending patience, her attention to detail was great, always available when we needed her. Simply put Revi is great, strongly recommend her. Revi, you truly are in a league of your own! You were such an amazing advocate for me and my family and a true joy to work with! I am so extremely impressed with your consistent professionalism, your willingness to jump through hoops and your creative, inventive solutions to every obstacle that we faced during the selling and purchasing process.You were ALWAYS accessible and you made me feel like I was your only client. You are extremely internet savvy and you understand how vital social networking is and how it relates to Real Estate. The quality of your service is unsurpassed. Revi, you truly are in a league of your own! You were always there when I needed you and you went above and beyond to explain every step in the process. What impresses me the most was your determination and grit to meet and exceed all of my needs. I would be very happy to recommend you to any and all of my friends and family who might be looking for a Realtor. And personally, I know that I have a friend... I can't wait until I work with you again. A heartfelt thank you. Revi was very patient with us as we narrowed down locations and characteristics that we wanted in our new home. She also made lots of useful suggestions to guide us when we wanted it, but was not overly pushy. She didn’t even bat an eye when we would change our minds or want to try a new strategy. She would just make it happen. We have been looking for a new place for a LONG time and have used a few realtors along the way. Revi was the one that finally seemed to be the right fit and got the job done for us. Also, Revi is very responsive and answers emails and texts very quickly and didn’t seem to mind all the questions we asked along the way. She pays attention to the small details. While we were in escrow, Revi took care of arranging all of the inspections and letting the inspectors in when we couldn’t be there in person. She has relationships with all of the people we needed for inspections and that made everything run smoothly. As you can probably tell, we highly recommend Revi if you are thinking of buying or selling anytime soon. With over 11 years of property sales and listing experience, Revi Mendelsohn consistently ranks as one of Rodeo Realty’s award winning agents for her annual production. Revi has an intuitive sense for helping her clients find their perfect home and also for achieving their goals when they are ready to sell. She is a professional with excellent negotiating skills as well as having a sound technical knowledge that helps protect her clients’ interests – providing for both exceptional results and a smooth transaction. We are so very proud to have Revi on our team and you will be glad to have her on yours. She helped guide us through so many complicated decisions. We recently sold our Mar Vista home and realtor Revi Mendelsohn worked with us from day one to put together a successful sale. She worked closely with us months before our home sale to determine what sort of improvements we might decide to make. She helped guide us through so many complicated decisions about the best ways to prepare our house to go on the market. Every step of the way, she was patient, professional, and extremely knowledgable. In fact, every piece of her advice paid off. We sold our house for way over our asking price and I'm certain the amazing result we achieved was due to her smart, sensitive, and forward-thinking approach. I had seen her recommended so many times online and wondered if she was really as good as everyone said. And I can tell you that she absolutely is the real deal. She is so easy to work with and will go to bat for you no matter what. You will not be disappointed. If you or anyone you know needs some real estate assistance, talk to Revi. You'll be so happy you did! Revi is great! She helped find a great place in the neighborhood we wanted. She is very knowledgeable about the market and is always available with answers to all questions we had. She was able to find solutions to all issues that arose during escrow. Would highly recommend her! I just had a question and could not figure it our on my own. I emailed Revi Mendelsohn and she got back to me and helped me understand my question. It was so awesome of her to help me and I was so impressed with her knowledge and professionalism. We are so lucky as a community to have such a great resource! Revi rescued us! We had been working with another agent for almost two years with no results. We finally moved on and found Revi through referrals. We immediately could tell the difference in her approach and professionalism and were in escrow on our new home within a few months! She has great knowledge of the local market and brokers which led to us getting a great price on our house; she even managed to get us a nice credit for repairs! As first time buyers she patiently guided us through the whole process and was always available to answer questions. We only wish we had found her earlier. Revi's greatest talent is understanding the individual needs of her clients and turning that into results. Revi was available till late hours to answer questions and help with the process. Revi proved to be quite knowledgeable, effective and easy to work with. She was able to get us into a property with sellers who were often uncooperative--e.g., not available to show the property, always late in delivering the documents the were required and had promised to provide in a timely fashion, and ... even worse when money was involved. Revi was available till late hours to answer questions and help with the process---anticipating and proactively addressing any snag and issue that might have delayed the closing. We were particularly happy that she took upon herself the difficult task of negotiating a new lease with the sellers and the current tenants who had asked to stay in the duplex fora couple of months longer. She is extremely knowledgeable, professional, hard working, and dedicated. As a first time homebuyer, I was apprehensive about the process, especially in a very competitive market (West LA). Working with Revi was an absolute pleasure, and made this otherwise daunting process very stress free, easy, and even fun. She is extremely knowledgeable, professional, hard working, and dedicated to her clients before, during, and after the sale. Revi was able to help guide me through a multiple offer situation, to ultimately help me win the property over 11 other buyers. She was very responsive to all my questions and needs, both during and after the sale, and even surprised me by having a few items fixed in the property that were brought up in the inspection! She is also very well networked, and connected me to a great electrician and painter to have some work done on my unit before and after I moved in. I have worked with many other real estate agents before, and Revi far surpasses them in quality, customer service, experience and so much more. I HIGHLY recommend her – you won’t be disappointed! Revi works at lightning speed! I first contacted Revi last summer to get a feel for the market after reading all the wonderful reviews online. She agreed to meet with me to discuss the current market, her thoughts on my unit and answer all my questions. I've worked with several real estate agents in the past and not only was Revi knowledgeable in her field, she was also very personable. I told her I wouldn't be ready to move forward until 2015 and she was very understanding and never pressured me to sell. When I finally reached out to her again, she advised me on how to handle my tenants, her selling strategy, renovations, and timeline. Let me tell you, Revi works at lightning speed! From the time I gave her the keys to my West LA condo, to the time renovations were complete took only 1 week. I was amazed as I thought it would take a minimum of several weeks. She has a handful of service providers and managed them all so that I didn't have to. Her attention to detail was impeccable. Our biggest expense was staging and she was able to negotiate a rate to fit my budget. Our home went on the market in less than 2 weeks. In less than a week we received 12 offers and sold at 12% above asking price. I can't tell you how happy I am with the personalized service Revi provided. She was always available, even at 10p at night as that's when things quiet down at my house. If you're looking for an experienced, hands on realtor, don't hesitate to contact Revi Mendelsohn! You will not be disappointed! We have just sold our house under the excellent guidance of Revi and cannot express how happy we were that we chose her to help with this process. From our first meeting, right until close of escrow, she was dedicated, impressive and very knowledgeable. We were not looking forward to selling our house as we really loved it, have two small children and time was of the essence. But she made the process really smooth and pain-free: she had an answer for every question, a solution for every problem, and a workman for every job! Her negotiations with prospective buyers' agents were sharp and wise, and it was obvious to us that her experience meant she really could predict buyers' moves and preempt any potential problems. She went above and beyond, was extremely reassuring and made herself very available throughout the whole process. And I suppose, most importantly, she marketed the property expertly which resulted in offers over $150K over the asking price! Several of our friends have already said that they will definitely use Revi if they decide to sell their home, and I cannot recommend her more highly! Thanks so much, Revi! You're the best! She helped me find my first home and made it into a great experience. Revi was an excellent find after I went through a number of agents that weren't a good match. Revi was extremely professional, honest, hard working and so much more. She helped me find my first home and made it into a great experience. She made herself readily available and seemed to have solutions for all the small problems that popped up (we all now things happen during a large transaction such as this). Her friendly and professional demeanor right off the bat, led me to realize that she's one of a kind. You won't regret it...reach out to Revi....she will make your real estate experience one of a kind! We are grateful to her for her service. It is my pleasure to let you all know that Revi Mendelsohn did an absolutely outstanding job in enabling my wife and I to purchase our beautiful home on a lovely street in Beverlywood! She proved herself -- time and time again -- as an excellent negotiator, a keen observer of detail, and an accomplished manager who was simply able to "get the job done." Revi spent a very considerable amount of time enabling us to navigate the numerous issues that arose concerning the entire sales process, and we are grateful to her for her service. She has an excellent knowledge of the real estate market, lots of patience, a great attention to detail, and was available when we needed her. Thank you Revi! Great job!! I applaud her positive attitude and helpfulness. Revi helped us buy a house and sell our condo in a very expedient and professional manner. Revi knows the local market and transaction process very well (as all agents should) but she is also a skilled problem solver who will walk you through the solution and keep you level-headed during the most stressful times. I applaud her positive attitude and helpfulness in closing both transactions with such ease and our utmost satisfaction! She is probably one of the hardest working real estate agents I have ever met. I have used Revi twice to buy a place, and once to sell. She is probably one of the hardest working real estate agents I have ever met; she answers almost instantly to any question you have for her; if she doesn't know the answer she will find it for you. She answers emails at 11pm or at 9am, she is always there. She works really hard to get you the place of your dreams for the price you want (realistically speaking). She was able to sell my condo for way over asking in 48 hours (and one open house), and she found me the house I wanted for a price I could afford. I trust her implicitly, and have referred her to many people who have felt the same way in working with her. Revi is the best agent! Revi is the best agent! She is always so helpful and approachable. Most importantly, she really cares about her clients. I ran into an unexpected loan issue when I was in my escrow period, and she tried her best to help me solve it. Revi battled against 22 other offers to get me my house. My Realtor, Revi Mendelsohn, helped my get my house; 22 bidders on it, but I really wanted it, and I wasn't an all cash buyer. She was soooooo awesome, I cannot begin to tell you what she put up with, but I can tell you how she handled it ....... brilliantly, as I am in the house! Good luck! I know how hard it is, especially when it is the house you really want! I am lucky to have you as my realtor. One hears the most awful things about realtors, and I want to say you have definitely proved all the stories wrong. Thank you for bearing with me through all of this; you have the patience of a saint, and have allowed me to bug you with requests of seeing places that you probably wouldn't send a cat to, and not said a word, but are right there for me, like tonight, when you realise that I can get a much better deal - maybe not for that house, but the next one will be there for me. Thanks for going through this with me, I appreciate it more than you could possibly know, and I am lucky to have you as my realtor. She is TRULY AMAZING and will definitely help you! My husband is a SENIOR INSPECTOR at LAROCCA INSPECTIONS (www.laroccainspect.com) and has worked with Revi Mendelsohn on numerous occasions. He highly recommends her for all your real estate needs. I want to give you a huge shout out for Revi on Peachhead! She is a Peachhead mom, and I first met her (from Peachhead)almost two years ago. She called me at 10pm, as that was a good time for me to chat, and she had no problems with calling me then, and we stayed on the phone for over an hour going through my options. stopped checking in on me, sending me emails about places that we could check out, and then I finally got really serious about 10 months ago about trying to find my first home. She never complained (not once) about the hundreds of emails I sent her about places, she never told me NO, she always had time for me ... and I found my first dream home a month ago, and we put in a bid. I had three major breakdowns through the process, and she held my hand and talked me through each one .... never once told me to stop being silly, to grow up, or that I was being stupid. I have to say I truly appreciate that, now thinking back on things!! have been able to do it without her. referrals, plumbing referrals, anything she can do to help me make it my own .......... WHO DOES THAT THESE DAYS???!!!! somewhere. I loved going through the whole process with her, and she really explained everything to me, and I cannot thank her enough. When you call her, tell her Michelle said she is the best!! In February/March 2007 Revi Mendelsohn handled with great patience, perseverance, and plain hard work, the purchase of 3345 Mandeville Canyon Road, Los Angeles, for me. This house sale will probably be the most bizarre and challenging negotiation of her career, involving a sitting tenant dying of cancer, two sellers with volatile tempers and vile language which they were not embarrassed to flaunt in front of Revi, and a buyer (me) sitting in Scotland. Most agents might simply have thrown up their hands in despair and said this cannot be done. Revi, through compassion for the very ill, elusive, difficult but charming tenant, huge amounts of tolerance for the sellers, and sheer determination to reach through the ether to the mysterious buyer in the UK and move this house into ownership, through me, to a charitable Trust, accomplished the impossible. She kept her good humour throughout some very tortuous and protracted negotiations and was extremely resourceful and energetic in finding solutions to all the legal and administrative hurdles, as well as those tossed up by some of the fractious personalities involved. Did I mention that all of this was accomplished in a mere 13 days? Now, our beloved tenant is with us no more, and the house will be resold by the Trust's beneficiary. And to whom shall we turn? Revi, of course! I hope she pursues her career at Coldwell Banker or elsewhere for many years to come so I can rely on her in all future. I believe I can spot the good ones, and Revi is definitely one of the good ones. I just wanted to say a few words commending your agent Revi Mendelsohn. I talked to Revi on the phone on very short notice to see your unit for out of town clients I had in yesterday. She was gracious enough to accommodate my request for a showing before open house time on a Sunday, which is a rarity among agents. While on the showing Revi impressed both my clients and me by answering our questions regarding coops and coop loans, explaining the differences between condos and coops, and with her knowledge of your unit and her preparation (giving us handouts of information right up front). I just wanted to let you know from my perspective having been in the business for 9 years an agent, and having grown up with the business as my mom has been an agent on the westside for over 30 years, I believe I can spot the good ones, and Revi is definitely one of the good ones. I could not imagine doing this without you. Thank you very much for all your input and your help. I could not imagine doing this without you. You've been above and beyond, the most valuable person to us through this process. You are a consummate professional and any buyer or seller would be extremely fortunate to have you on their side. I just wanted to send you a note to thank you for all of your hard work on the sale of my property in Cheviot Hills. I still can't believe that we were able to sell the property for $75,000 more than the first agent that we contacted thought it was worth. If it were not for you, I would not have been able to co-ordinate the renovations that were done on the house. From collecting bids to managing the process, I feel so lucky to have had you there for me every step of the way. I am also sure that we got such a good deal on the work done because of your relationships with the painter, floor refinisher, etc. Thank you for that too!! I now have a much better understanding of what a Realtor does and I think that it would have been nearly impossible for me to have closed this sale without you. When the buyer ran into some difficulties with their loan, you negotiated on my behalf to have them release their deposit, and you truly kept the deal together. Revi, I think that you are a consummate professional and any buyer or seller would be extremely fortunate to have you on their side. Thank you again for everything, and I am looking forward to working with you again on my next Real Estate purchase. Clearly you are very well respected. I just wanted to write and thank you for handling the Greenfield sale. I think you did a superb job, you were professional and handled things well. Without you we would not have been able to prepare the home in the short period of time that we did, and have it look as good as it did. I jokingly told you that you had until March 17 to sell the home and you actually did it! I still can't believe that with only 7 days on the market, you were able to get us a sales price over asking and to close in 30 days. I truly believe that there is not a Realtor out there that could have handled all of the issues that you took care of for us. You have an incredible team behind you and any client would be very lucky to have you working with them. I am still in awe that you were able to connect us with all of the right people, from attorneys, to landscapers, to stagers, to get the job done. Clearly you are very well respected as each and every one of your recommendations and contacts came through for us. On top of all that, you baked homemade chocolate chip cookies for all of your open house guests! Is there anything that you can't do? Thank you very much and we will do business again! WHY REVI MENDELSOHN IS MY FAVORITE REALTOR ................ I just wanted to tell y'all what a wonderful realtor Revi Mendelsohn is (& a peachhead Mom) because we all like to help eachother out here and I think we all deserve to have the very best resources on our side. Revi made us feel like we were priority #1 and worked like an animal to get us the best deal we could get on our home. She really knows this area and gave us all the information we needed and wanted to make good informed decisions all the way through the process. She was super-accessible and gave us insider access to the MLS so every 1/2 hour so we knew what properties' status were. (Returns calls and emails super-promptly and worked with my schedule.. even at night). She had relationships with other professionals-loan, contractor etc to help us make good decisions in quick time. I witnessed interactions she had with other realtors and her negotiating skills are unbelievable. Situations that made made me cringe, she turned around into laughter and solution-oriented discussions. I interviewed and tried working with a few others over the 9 year process of trying to buy a home...and we finally bought one with Revi and it was a great decision. You are welcome to call or email me if you have questions about using her as your agent. If you are looking to buy or sell a house in west LA, call her. Revi honestly cares about each of her clients. Revi, a long time, dear friend and our fabulous Real Estate agent, recently helped us to find our dream home, in Cheviot Hills... and afterward, to sell our lovely town home, in Santa Monica. In the so many ways that Revi goes above and beyond for her clients, she also does indeed make a mean chocolate chip cookie! These two pieces of info are related, in that Revi bakes these scrumptious delights - in your selling home, creating a fabulous aroma - and she serves these - piping hot out of the oven, during the open house. During our open house, an agent and her client, had come in for a walk through, while the cookies were baking. They were disappointed to find that the cookies would not be ready for another 15 minutes. They left, expressing interest in the place - but not committing by sticking around to ask any questions. Exactly 15 minutes after having left, these two came back to try a cookie. As they ate...and ate..and ate, Revi chatted casually with them, answering questions about our town home. Many people came through...several expressing interest...all eating and complimenting the cookies, others coming in b/c they said that they could smell the cookies from the street. A handful of people called that day to make an offer (Revi had priced it so well, that we had 7 offers in one day, and ended up closing escrow in 14 days from that day!) ...But guess who bought the place? That first guy who came by the first time to find that they cookies were not ready... and who came back a second time to eat them - while Revi charmed him (and his agent) with her outgoing personality and expertise in the Real Estate market! Although ultimately, the sale of the place was due to a variety of factors; location, competitive price, condition... i am still convinced that those cookies brought us good luck! In finding our new home, Revi was by our side for month after month after month. She was strong with us when we needed it, and she gave us space, when it seemed right. Revi gave us information to ponder, and taught us smart ways to approach or look at, buying a home. She came with an organized 'formula,' outlining the process for us, predicting some potential kinks - and offered solutions to either preventing or dealing with, these inevitable steps. Revi has professional relationships with many of the other local agents - allowing for her to work along side them both officially, and comfortably. Revi is a class act - no "slimy" or immoral maneuvers as we came across in other Realtors, now and again. Although some are hesitant to, "mix business with friendship," we truly feel that this was an asset to the buying and selling of our homes. Revi puts her heart and head into every move. She has fore-thought and wisdom. She is feisty and not scared to ask questions - yet warm and friendly - eliciting comfort and trust from all who encounter her - sellers and other agents, alike. Revi exceeded our expectations repeatedly throughout the process - and ours was a long and torture-some buying process! Just at the point where my husband and I were willing to give up - after much back and forth with the sellers of our new home..and even though we were dying to get this house, we were depleted of any more ideas or energy, as the sellers were holding firm in areas that did not seem to fit with the comps in the area. Revi could have given up along with us - but she did not. She came up with yet another strategy to get this house at a price/allowances, that felt fair. We worked as a team - both buyers and agent to carry out her idea - and it worked! I attribute this not only to her hard work and knowledge of the business, and not only to her creative perseverance and high standards... but also to our prior connection as friends. She truly cared about this situation. She put her heart and soul into making this transaction successful for all. The truth is - and Revi may be too modest to admit this - but even if not a friend prior to this working relationship, Revi honestly cares about each of her clients. I hear it in the way others talk about her, and I see it in Revi's eyes, when she shares little stories about her experiences. I am happy to rave about Revi Mendelsohn as a Real Estate Agent - anytime. Feel free to contact me with questions. I must say though, you do not need to look any further, if you or your friends are looking for one of the best Agents in LA! Revi is dedicated, confident, resourceful, well-versed in both market and the LA world of home buying/selling, and her enthusiasm, exudes. (Her info is pasted below)Revi has a team of very reliable specialists in her 'Rolodex' who can help the selling/buying process along - from Handyman to Inspector, from Home Stager to Rug Whole Saler, from Building Engineers to Painters. Revi herself, is quite resourceful and also does her own leg/home work, to find just the right light switch to complete your sale home rooms... or just the right touch-up tools to help make a room complete. Revi can even put you in touch with a Personal Organizer - to move you out of your old, or settle you into your new, home. In the end, those chocolate chip cookies, are 'icing on the cake' - but for us, they will forever be considered our good luck charm! Revi is smart and incredibly hard working. My husband and I highly recommend Revi Mendelsohn. She helped us when we bought a house last June and was indispensable when we sold our condo this past fall. Revi is smart and incredibly hard working. She knows the area really well and will do a great job for you! We do not trust or like realtors as a general rule but found Revi to be exceptional. Best of luck finding a home you love!